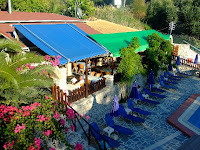 The Irini studios are on the outskirts of Parga (a few more paces down the road and you pass the sign indicating you are leaving Parga) but it is an easy walk into town either by the track running down behind the studios that leads down to the beach or by the main road which now has a recently built pavement running along it. The pavement makes a big difference as, although it has not been completely finished (the top paveing has yet to be laid) it does mean you are not constantly watching out for cars and bikes while you walk. The path and back roads is probably a more pleasant route but the main road is easier going and now well lit when returning after dark. The studios themselves are a 4 storey block built on the hillside such that the "ground" floor is got to by decending a stairway from the higher up "front" of the building. We were on the 2nd floor which from the front is only a half flight of steps up. All the rooms have balconies (or terrace) facing roughly south so get the sun during the day. There are 16 rooms in total. Inside the room are fairly standard basic Greek self catering accomodation but the owner Christos has added proper kettles this year rather than the little water pans you find in many Greek places. There are a few spare sockets in the room and one is well located by the dressing table (often overlooked in many places I've stayed and alwaays a pain for the ladies with a assortment of electrical haircare devices!). There was a a small electric oven with a three plate hob if you want to cook for yourself (never used it so I can't vouch if it even worked, but I'm sure it would had we tried) and a fridge. One other nice touch was that Christos had supplied a scouring pad and cleaning cloth - a small thing I know, but it's the kind of thing you never think to pack and is often on the list for the first "supplies" shopping trip of the holiday. The style of theb rooms is not particularly modern, with old style wooden multi-pane patio doors and windows. These have wooden shutters on the outside to keep the light out when you're sleeping. The water is on a timer rather than the usual solar heating so you get hot water in the mornings, early afternoon and then from about 5 to 8pm. Aircon is available but at extra cost (in September we didn't need it) and the balconies have convenient clothes drying lines attached to the railings. 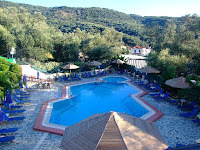 Next to the apartment block is the pool (Hexangonal) and the bar where Christos and his family (his wife Irini is who the srtudios are named after) can provide any drinks you need together with breakfasts and meals. 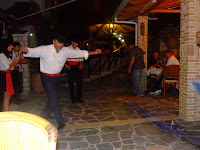 There are ample sunbeds round the pool for the guests and Christos keeps the place very clean. The whole area is very well laid out on several levels down the hillside and faced in a crazy paving sytle stonework. The wooden topped sunshades are static which is a bit of a shame as it makes it less easy to ensure you have either sun or shade (depending on your preferance) but the bar is only about 10 steps up from the pool where there's ample seating in the shade. There's also toilets and showers round the pool area and the whole studio complex has lots of palms, flower beds, potted plants etc to give it a really good atmosphere. Friday evenings Christos puts on a Greek evening with a BBQ (loads of food) and teaches you some Greek dancing, which costs €25 per couple (as of May 2009) which is usually a great evening. 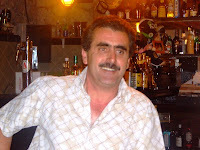 Christos himself we have always found very helpful with questions you may have and quite often puts himself out to help - he's offered to drive us to Lichnos Beach to save us the hour walk and even went to to pick up our friends staying in town to bring them up to the BBQ. Christos has now built an extra two bedroom apartment (although he still had to fit the doors as of last week - May 18th 2010) and these look very good. Really nicely furnished with solid wood balcony furniture. There's a bathroom for each bedroom with a really big shower area, and if you want to put 6 people in there, bth of the sofas in the sitting room/kitchen/dinner fold down to form extra beds. He's also added mosquito nets to the windows in the rooms so you can let the sir in without the insects at night. very nice!